BOOM! Studios is celebrating Christmas a little early in announcing a second printing of Klaus #1. The Grant Morrison/Dan Mora issue details the epic, historic origin of Santa Claus has sold out at the distributor level. Klaus #1 second print ships with a recolored main cover by Mora and carries a retail price of $3.99 under Diamond Code OCT158148. Orders close on November 23rd, and copies are anticipated to be in stores on December 9th. Comic book fans should bear in mind that first printings of Klaus #1 may still be found at the local comic shop nearest you. Full press release below. November 12, 2015 (Los Angeles, Calif.) - Award-winning publisher BOOM! 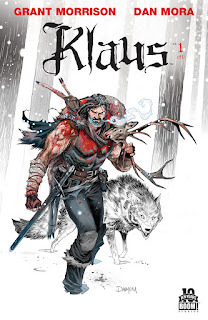 Studios is pleased to announce that Grant Morrison and Dan Mora’s first issue of Klaus, their hit original comic series that details the epic, historic origin of the one and only Santa Claus, has sold out at the distributor level. The publisher has rushed to a second printing to fill demand. Klaus #1 second print ships with a recolored main cover by Mora and carries a retail price of $3.99 under Diamond Code OCT158148. Orders close on November 23rd, and copies are anticipated to be in stores on December 9th. Comic book fans should bear in mind that first printings of Klaus #1 may still be found at the local comic shop nearest you. Not sure where to find your nearest comic retailer? Use comicshoplocator.com or findacomicshop.com to find one!